Typically, lighter colors make a space look larger and darker colors can shrink a space. If you are tiling a small guest bathroom, black tile may not be the best choice. Light, neutral tones work well in narrow hallways and guest bathrooms. A rich, dark tile can really give a large space some depth. Deeper colors work well in well-lit areas as well. Your tile selections for the bathroom wall most likely differ from the kitchen floor. Be aware of which space needs to be covered and how that space will be used. The bathroom wall can have smooth glass tiles, but that would be a huge slipping hazard on the floor of either the bathroom or the kitchen. If you are tiling a backsplash, don’t be afraid of bold color. 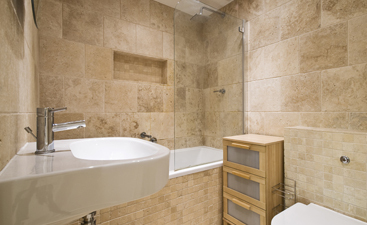 If you are tiling the floor of a shower, make sure you are choosing small tiles that will make you less likely to slip. As far as color goes, you may be more willing to have a bold color design on the floor of your shower than your shower wall. Think about how you want to feel in the room you are tiling. 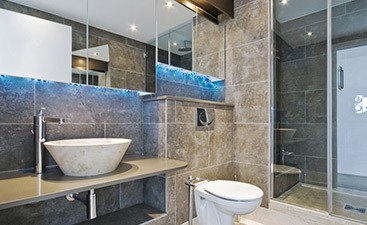 Do you want to feel relaxed and at ease in the bathroom? Do you want to feel bright and energized in the kitchen? Certain color combinations can make you feel one way or another. Consider the color wheel: typically we recommend choosing neighboring colors for a calm space, or playing with opposite colors for a more energetic space. Think about how the color wheel is laid out: when blue and green are side-by-side, it looks pleasant. If you choose neighboring colors on the color wheel, you will notice how the colors seem to flow into one another. However, blue and orange create a little more dissonance when paired together. This visual surprise can help add a pop of energy to a space. How popular is the room? By popular, we mean, how many times do you go in and out of that room each day? How much traffic does it see? If you want to tile the floor of your entryway and you have kids, it may be wise to consider a darker, marbled tile to hide small bits of dirt that can sneak in on shoes. 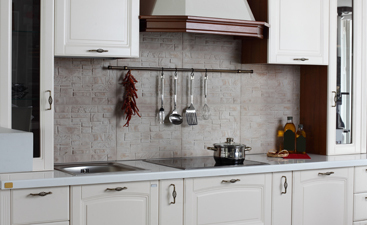 Most textured, neutral tiles can disguise scuff marks and scratches as well. However, this is something you probably will not need to consider in the bathroom. While we have listed some guidelines for choosing color, feel free to choose whatever color fits your style best. This is your home, so let it reflect who you are! If you are bright and vibrant, don’t be afraid to let your space reflect that with some energizing color. No matter what your tile color and style needs may be, Transworld Tile can help you select and install the best choice for your home.